This is an old style that was discontinued and then re-released in 2017. This net of marbles is a set of marbles from Mega Marbles including 24 Target or 5/8" marbles and 1 Boulder or 1" marble. 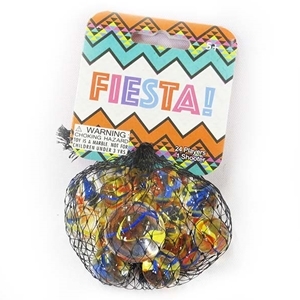 Fiesta marbles have a clear base with streamers of opaque red, yellow, and blue. Warning! : Choking Hazard. This toy is a marble. Not for children under 5 years.